You may have heard of puka shell necklaces, or maybe you own one, but you’ve never heard of a seashell called a “puka” (or sometimes “puca”). That is because the name “puka” is Hawaiian and means “hole” and was given to the bits of cone shells that had naturally occurring holes making them perfect for being strung on some sort of twine or string to become a necklace. 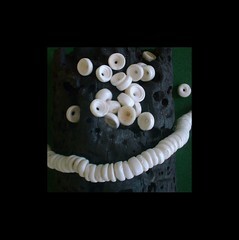 Natural puka shell necklaces (as opposed to fake) are made when bits of cone shells are collected with a naturally occurring hole found in the center. The hole is created when the empty shell rolls around in the surf which causes it to break apart. The top spire – pointed, top part of the shell – remains in tact but the very top eventually wears away leaving a hole. “Puka” means “hole” in Hawaiian and that is how the “shell” gets it’s name. So the shells are found in Hawaiian waters, and Hawaii is a good place to find authentic puca necklaces. The mollusk also lives in other warm water locations. They can be found in the Gulf of Mexico, Caribbean, and more warm-water locations around the world. The mollusk is capable of stinging, so beware of picking up a living cone shell. Generally it’s a tightly wound, cone-shaped (could have guessed that!) 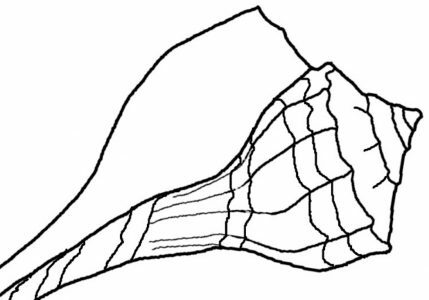 shell with a flattened top. They are known to be brightly colored with splotches, dots or jagged stripes. Any shell that has been sitting in the sun could also be bleached white. As you can imagine, it takes time and wear from the ocean for the bits to be created. Someone (or many someones) must go out into the ocean and search for these bits of shell that are just right for jewelry making. They will need to find hundreds of shell bits to make a single necklace. As you may have guessed by now, human beings have perfected ways to imitate mother nature and make the “pukas” in bulk without having to be in the Hawaiian islands or go searching for these bits of shell. Many of puka shell necklaces for sale are “fakes”. If you want to purchase a real puka shell necklace, do your homework and save your money. Real ones will carry a high price. I used to work in an Island where on the other end the beach was called Puka beach. There used to be an abundance of them but then at the height of its popularity a lot of people got greedy and there’s barely left on that beach. I still have a few pieces that I bought from the local fishermen’s wives and children who makes them into necklaces. great post. As always, it seems that greedy people have to ruin it for us. Glad you came by and said hello.